We'll start with a look at the color quality of the U2711, broken down into two areas: Color gamut and color accuracy (i.e. Delta E). We'll start by explaining the former. 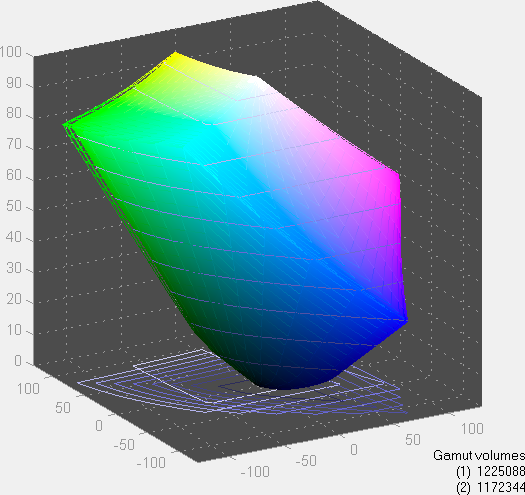 Color gamut refers to the ability for a display to represent all of the colors in a defined selection of colors. 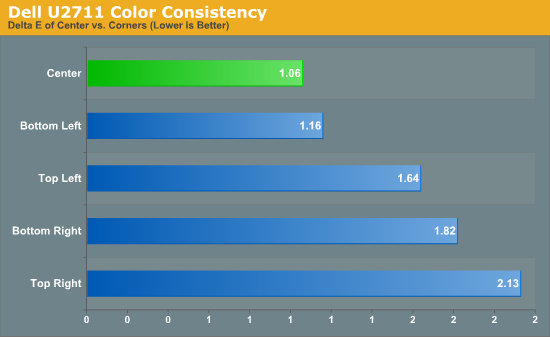 In this case, we use the Adobe RGB standard to define the base gamut, and we measure the percentage of that standard that a display is able to cover - higher being better. Delta E is the difference between a requested color and the color that actually appears on the display, with lower being better - i.e. the displayed color doesn't have a large delta relative to what was requested. 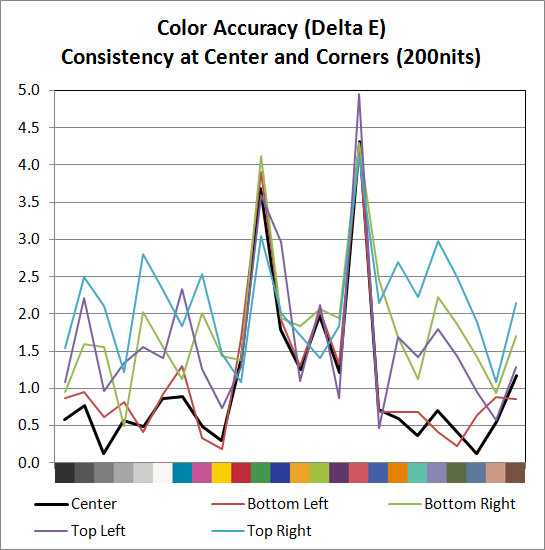 If a display has perfect color accuracy, Delta E will be 0.0; in practice, anything less than 1.0 is nearly perfect and no one will notice the difference. A Delta E of 2.0 or less is the desired result after calibration, meaning no one color measures higher than 2.0 on our standard 24 color palette. Such a result would be fit for use in any professional imaging environment. Finally, while Delta E of around 4.0 is visible to the naked eye, it's really a question of reference points; if you don't have something better nearby and you're not going to print or view content on other media, a result where all colors measure 4.0 or less is very good. So how does the U2711 do in these areas? First let's look at the charts, and then we'll discuss what they mean. We used the Graphics and Adobe RGB setting on the U2711, with brightness set at 36% (~200nits) and contrast at the default 50%. 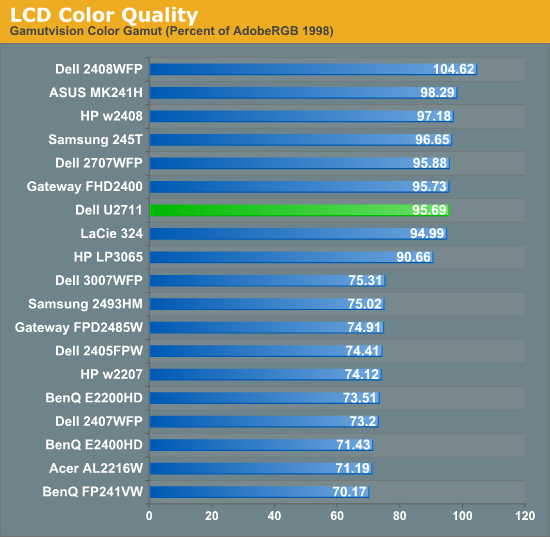 The U2711 scores extremely well in color gamut, and it achieves the 96% of Adobe RGB that Dell claims in their literature (not that most users would really notice the difference between any of the displays rated 90% to 105% - at least not after you eliminate the TN panels). Color accuracy on the other hand is a bit of a mixed bag. 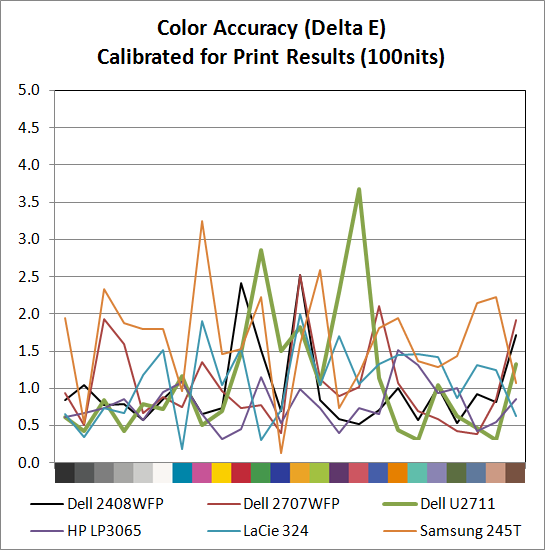 Dell ships a paper with test results showing the color calibration of each individual U2711, with the claim that the displays will have an average Delta E of less than 5.0 without any end-user calibration (when using the sRGB and Adobe RGB settings). 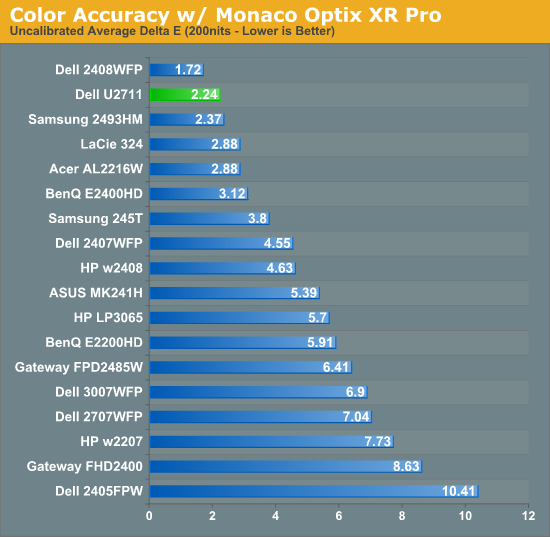 Dell uses Minolta Color Analyzer CA210 and 32 test colors while we test with ColorEyes Display Pro and Monaco Optix XR Pro and 24 test colors, but our Monaco results confirm their claim. We're not sure why, but we continue to get better results using Optix XR Pro than with ColorEyes Display Pro. As far as Optix is concerned, the U2711 achieves the rated Delta E of < 5.0 at just 2.24 without calibration, which is an excellent result. In fact the U2711 has no colors in the standard Gretag Macbeth 24 color palette score higher than 5.0 (and only reddish-pink scores a 5.0 measurement). 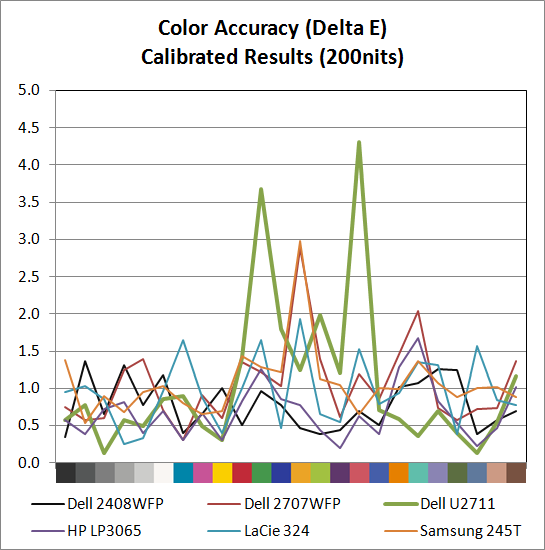 The only LCD we've tested that did better is Dell's own 2408WFP (which also, interestingly enough, had an Adobe RGB color gamut of 105%). ColorEyes also gives an average Delta E of less than 5.0, but at 4.78 the score isn't nearly as remarkable, with nine color measurements well above 5.0. 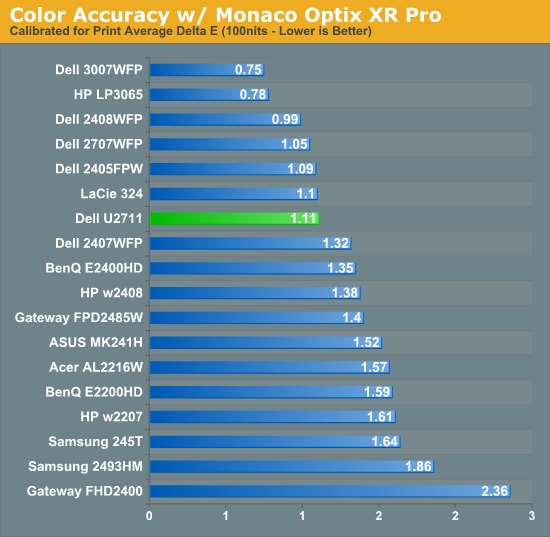 The uncalibrated (Monaco) results put the U2711 ahead of the HP LP3065, Dell 2707WFP, Samsung 245T, and LaCie 324 - and just about every other LCD we've tested. Switch to the calibrated results and the U2711 doesn't impress quite as much relative to the competition. 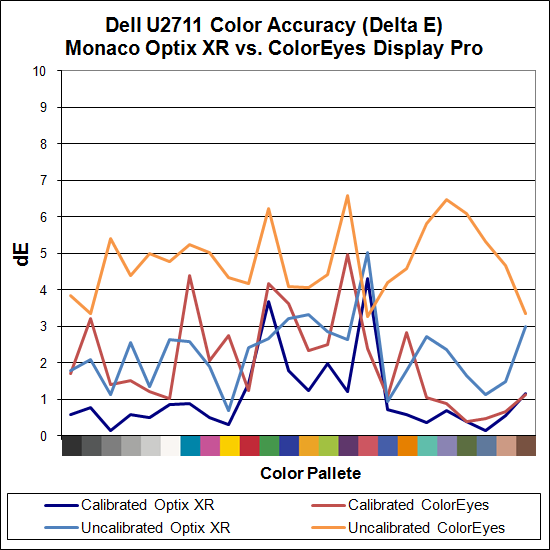 Monaco gives the U2711 an average Delta E of 1.06, which is great, but there are two results above 3.0 (the worst is reddish-pink again, this time at 4.31) compared to displays like the HP LP3065 where the highest measured Delta E is just 1.68. 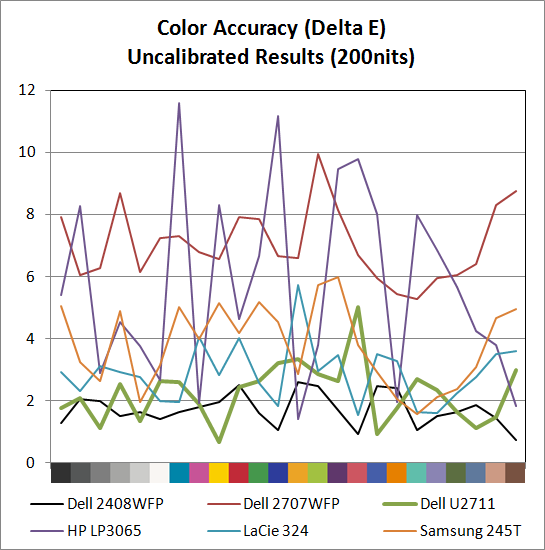 Dell's own 2707WFP, a three-year-old offering, also delivered a similar average Delta E but with only two colors above 2.0 (and still under 3.0). For a better LCD (i.e. not a TN panel), the results are really only slightly above average. It is possible different calibration software would achieve a better end result, but really we're talking about a "problem" that only the most demanding users are likely to ever notice. We added another test to try and measure the panel consistency across the entire surface. We measure Delta E at the center of the display, but what happens on the edges? To test this, we used the same profile generated in our best Delta E test result and measured Delta E again at the four corners. Most of the scores are similar, with a slight increase in average Delta E relative to the center measurement. The bottom-left corner is nearly identical to the center measurement, the top-left and bottom-right are a bit worse, and the top-right corner gets the overall worst result. While on the one hand we could say that the Delta E on the top-right is twice that of the center measurement, it's not a case of being "twice as bad". In fact, the color consistency is very good, and we didn't notice any "hot spots" are areas where the colors were clearly off relative to the rest of the LCD. Thank you for such great display reviews. I am an avid fan and have found no others as good. 1)Would you please do a review comparing good quality LCD and Plasma TVs to a "computer monitor" like the HP 3065. I am a pro photographer and spend most of my days processing images. I find it easiest to see artifacts and other processing problems on displays with bigger pixel pitches (like my Dad's 1080p 58" Panasonic Plasma). I guess I'm saying that I want to see my images at their worst, but accurately. I'm about to pull the trigger and move to a 35-45" LCD or Plasma TV as my prime editing monitor, but I'd like to see how they stack up in one of your top-notch reviews. 2)Where can I get Monaco XR software. I have the DTP 94 colorimeter, but I need the software. I have used ColorEyes form many years, but have never been happy with it. And now I can't even get it installed on Windows 7. Looking for a big screen, how do the 30 inch monitors from Dell compare? I wish there was a nice big chart with several of the monitors in this range. The lag when turning on and switching resolutions is really annoying on the 3008WFP. I switch between my Macbook Pro and my desktop PC and the lag annoys me. Otherwise I haven't noticed any real input lag problems with the display. You could pick up one of these for personal use, they aren't all that expensive and the result is pretty good for the price. And the main difference is the software mostly, a few extra features on the Pro software, like being able to set gamma and cool/neutral/warm color temps through the tray tool. The results I've got with my Dell 3008WFP with the Huey Pro are quite good, while it doesn't detect reds all that perfectly, I don't mind the slight red tint, it makes it alot easier to sit 30cm away from the monitor and have it not hurt my eyes. Very nice article. I enjoyed reading it as I am in the market for something like this. 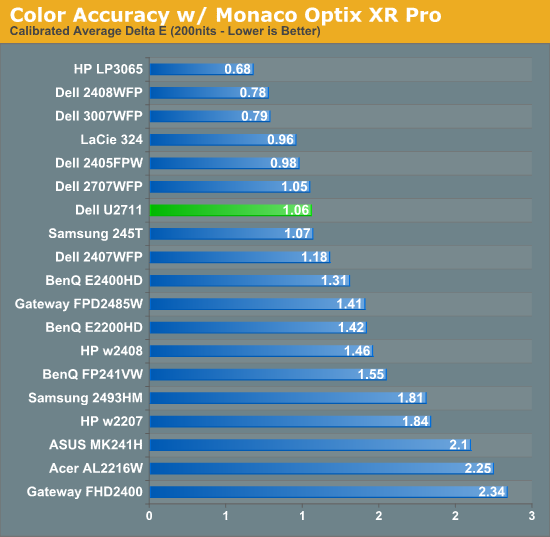 One thing that caught my eye was your comment regarding better results using Monaco Optix over Coloreyes Display Pro and remembered seeing Integrated Color recommending using the Spyder 3 calibration puck over the otherwise recommended DTP-94 when calibrating wide gamut displays. I believe the DTP-94 is the same colorimeter as the one you use. Perhaps the older puck isn't sensitive enough to the new wide gamut. (see link). Thought you might be interested in this. Thanks.